Here are my favourite pieces of Peruvian cuisine. Ceviche is the national dish in Peru and you should not leave the country without trying it at least once. Some say that Lima is the best place to eat it, but you can get good ceviche all along the coast. The dish is made of raw fish marinated in lime juice. As a side dish, you often find onions and choclo, giant kernels of corn. 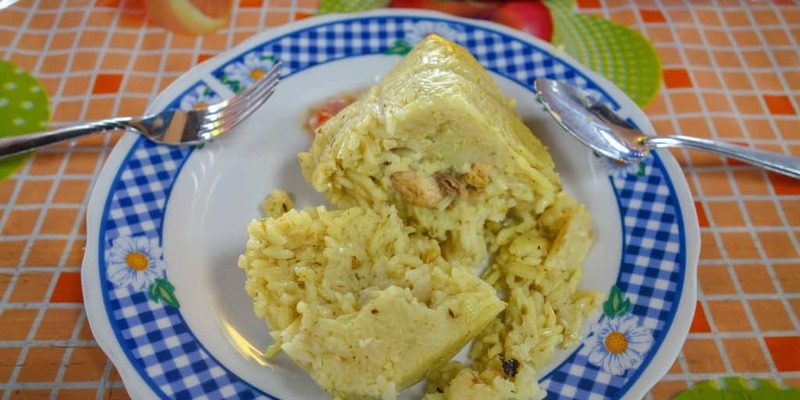 Depending on where in Peru you are, you can find many variations of this dish. 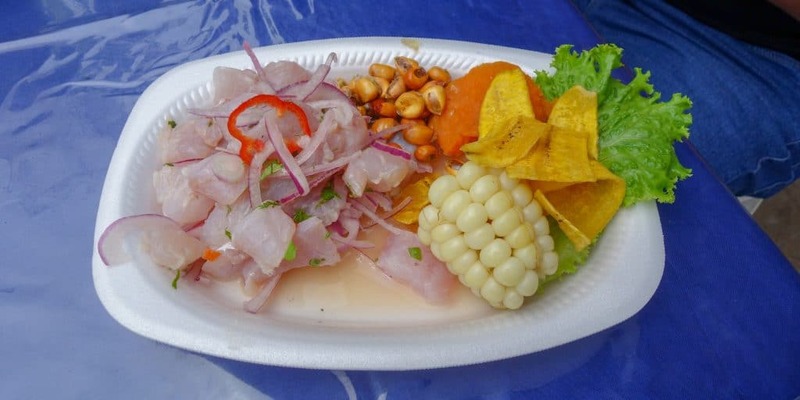 The southern regions use fish, the northern regions use seafood or a mixture and in the Andes, it is no surprise that most people prepare ceviche with trout. Some restaurants add more, others fewer chilies (so always ask how spicy it is going to be). In some places, ceviche is served with a hint of passionfruit juice, milk, garlic or cilantro. I even heard of a chicken ceviche in the Andes, although I have never seen it and would strongly advise against eating raw chicken. Out of all the food in Peru, the one I liked second best is aji de gallina. I ate this multiple times, as a dish served with rice in Lima or as a topping for potatoes in Arequipa. 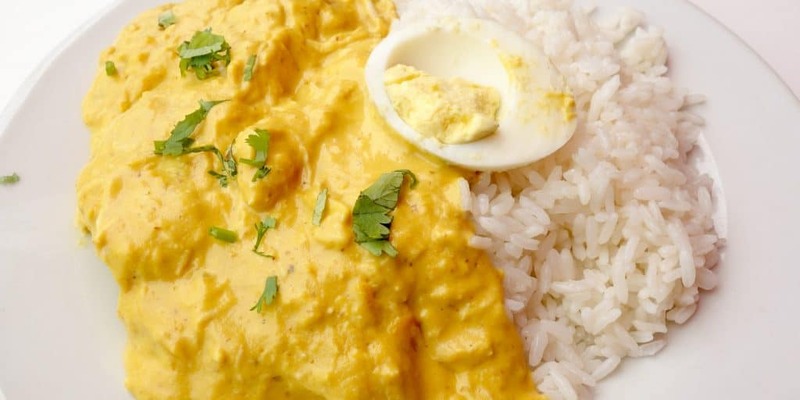 Aji de gallina is chicken served in a cheese and walnut sauce. The sauce gets its colour from yellow peppers, called aji, and often contains black olives. The dish is slightly spicy and most places serve it with rice or potatoes (or both) and add a hard-boiled egg on top. It is the perfect food to eat high in the Andes on a cold evening when you need to warm up. Lomo saltado is another famous Peruvian dish. I learned about its existence shortly after arriving in Lima, when our taxi driver told us that this was the one thing we absolutely had to try while in Peru. Lomo saltado is a good example for Peruvian-Chinese fusion cuisine as it is a beef stir-fry that has been brought to the country by Chinese immigrants and has since then become a typical Peruvian dish. It consists of strips of marinated beef, onions, tomatoes, peppers (often the aji that is also used in aji de gallina) and various other vegetables that vary from region to region and restaurant to restaurant. Depending on where you eat it, you might also find fried potatoes on your plate. It is often served with rice, and sometimes also french fries. 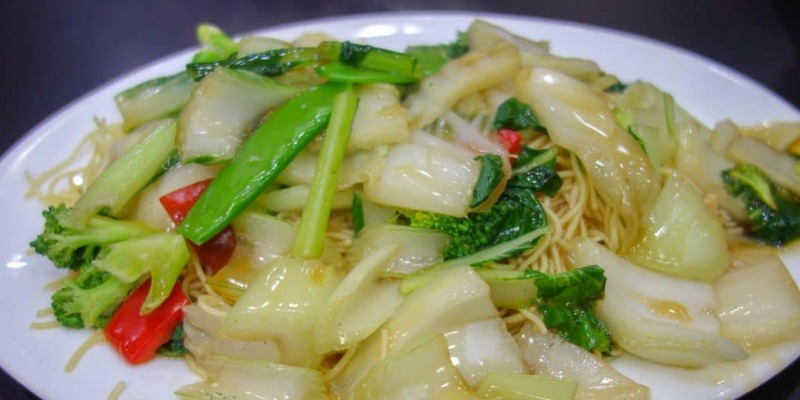 This dish is a classic that you can often find in small restaurants and at market stalls. We had some excellent rocoto relleno at the market in Arequipa, which is where the dish supposedly comes from. 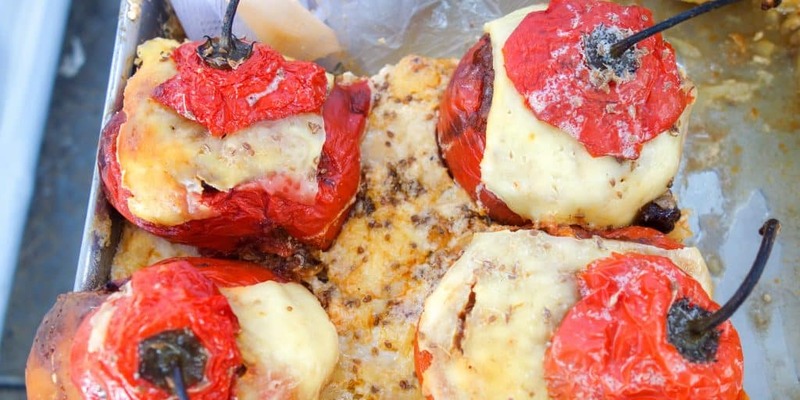 Rocotos are peppers and relleno means stuffed, so rocoto relleno is peppers filled with ground beef, herbs and spices, onions, garlic, olives and whatever else the cook wanted to put in there. While rocotos are supposed to be slightly spicy, I remember the one I ate being very mild. Or maybe it was a bell pepper that they had served. Whatever it was, this dish is delicious and full of flavours thanks to its many ingredients. And if it’s too spicy, wash it down with a glass of chicha morada. Back home in my supermarket in Germany, I have the choice between maybe three or four kinds of potatoes. In Peru, locals know hundreds of varieties. I have tried purple and orange ones, some that tasted buttery and others that crumbled into pieces in my mouth (if you want to get a taste yourself, go to the Hatunpa restaurant in Arequipa). It is no surprise that potatoes play a huge role in Peruvian cuisine. 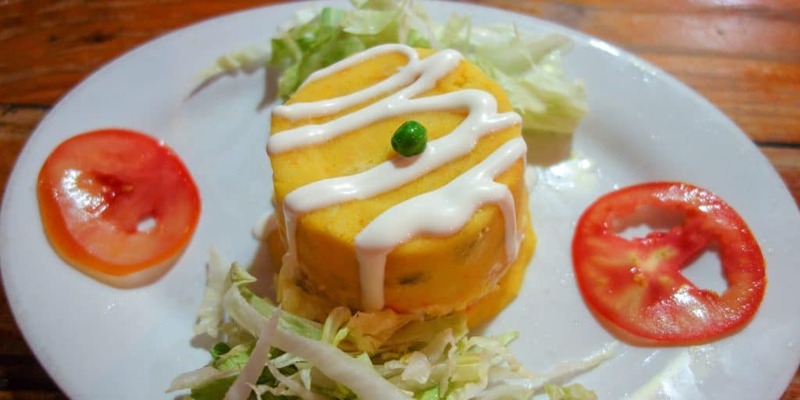 Causa is one of those dishes that consists mainly of potatoes. It is basically mashed potatoes with lime and salt, often shaped like a small cake and topped with mayonnaise, chillies, vegetables or meat. The varieties are endless. Rellena means filled, so in case you order causa rellena, the mashed potatoes are not topped but filled. The taste is the same and causa rellena is a brilliant appetizer or side dish. Talking about potatoes. 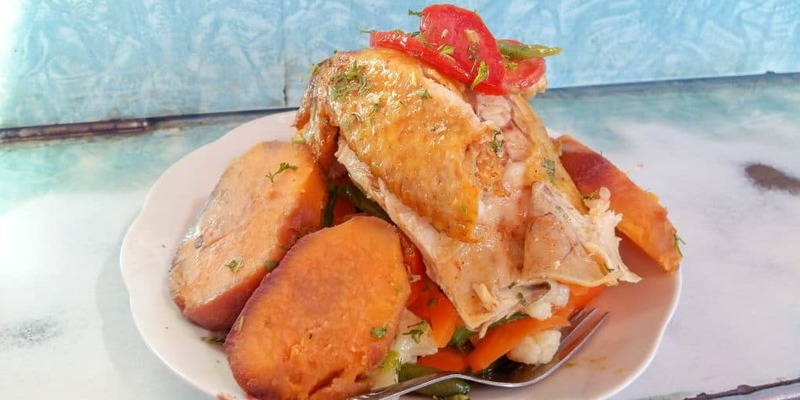 Papa a la huancaina is another typical Peruvian dish based on potatoes. It consists of boiled and sliced potatoes that are topped with a yellow creamy sauce, similar to the one you would get when ordering aji de gallina. To top it off, most people put a hard-boiled egg on top. Usually, you would order papa a la huancaina as a starter or a side dish. Some restaurants offer it as an appetizer on their menu del día. I have seen it both as a hot as well as a cold variation, depending on the weather. In boiling hot Nazca, you eat it cold, high up in the Andes, chances are high that you’ll get a warm version. 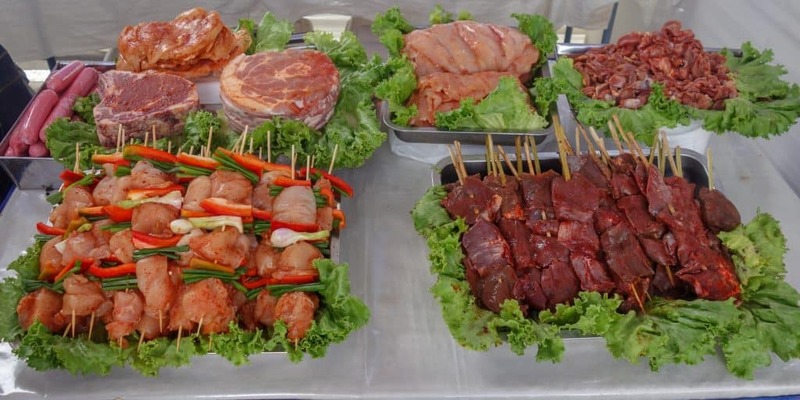 In Peru, you get the chance to try exotic meats, including llama and alpaca. If you have a choice, go for the alpaca. It is more expensive but also far more tender than llama. Many restaurants only serve alpaca because they consider llama to be of such low quality that it’s not even on their menu. I wouldn’t agree with that, since I had an excellent llama stew in Argentina, but I would still prefer alpaca. Alpaca can be served in many ways. You can find it in stews, as a steak or as a burger. My friend had a really good alpaca burger in Cuzco, which was some of the best food we ate in Peru. Chifa is a generic word for Asian food and you can find it all over Peru. The first Asian community originated in Lima in the 17th century and another wave of immigrants followed in the 19th century. Despite Asians only making up 3% of the Peruvian population, their food is very popular. Every town has a chifa restaurant. You can get fried rice (arroz chaufa), fried noodles and soups. The food is just as Chinese as in other China restaurants outside Asia, so don’t expect anything authentic. Instead, you will find Asian dishes mixed with local ingredients. Arroz chaufa is the most common staple. It is, as already mentioned, fried rice with egg, some kind of meat and vegetables. Let’s move to the jungle, to Iquitos to be precise. This is where I first tried juane. People in the Amazon region eat it on June 24th, for the festival of St John the Baptist. The poor guy was beheaded and the juane that people eat that day represents his head. A bit cruel, if you ask me, but that’s their tradition. Don’t let that strange story scare you off. Juane is a delicious package wrapped in a banana leaf. Inside, you can find rice, meat, eggs and olives. The ingredients vary from region to region and also in between different restaurants, so don’t be surprised if you open the leaves and find cassava or beans. It is like a large surprise package. One of the best places to eat juane is at the markets in Iquitos. I didn’t know of this dish until I went to a street food festival in Barranco, Lima’s artsy neighbourhood. We looked at every stall and finally decided to get the yuca with cheese. 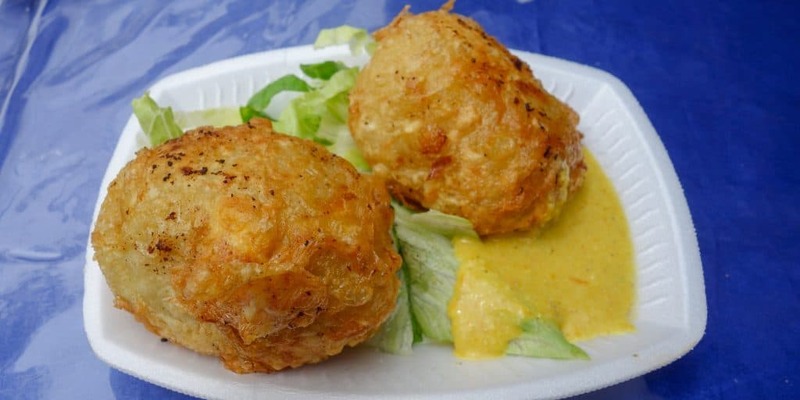 An enthusiastic cook served us small balls of mashed yuca filled with cheese. It was delicious! If you ever see those little balls somewhere on the streets, get them. They are the perfect snack to eat in the afternoon, when you’re feeling hungry. I found escabeche de pollo at a market in Arequipa when looking for a place to have lunch. It basically means marinated chicken. Escabeche is a mixture of onions, vinegar and honey that has been around in Peru ever since the Spaniards arrived five hundred years ago. Its origins, though, are Arabic and the technique was brought to Spain by the Moors who then carried it over to South America. When I ordered escabeche de pollo, I got a giant piece of chicken and lots of vegetables on the side. The vendor also offered me mashed potatoes but there was no way I could have fit them on my plate. Both the chicken and the vegetables had been marinated in the same sauce and it tasted delicious. Just watch out. As this was market food, it was served cold. Ask if you can get it “caliente”, which means warm in Spanish. Tacu tacu is a staple of Peruvian cuisine that I saw on more than one menu in Lima. It took me a while to understand that it was a side dish. Tacu tacu is one of those dishes based on leftovers, in this case, rice and beans. The rice and the cooked beans are mixed together. The cook then shapes it into a large patty and fries it in a pan. Usually, you will eat tacu tacu with steak, fried egg or any other kind of meat, even though it could also be a meal in itself. If you want to try some typical Peruvian street food, go for the anticuchos. They are beef hearts grilled on a stick. Don’t let the word “heart” scare you off. I am not a huge fan of any kind of organ, but anticuchos are delicious. If I hadn’t known that they are hearts, I wouldn’t have guessed. The meat was tender and tasted like beef. In case you’re not convinced yet: When we eat meat, we eat muscles. The heart is a muscle as well. It does not have a weird texture or flavour. Instead, it tastes like marinade and barbeque. As I said, I highly recommend these skewers. I just had to mention this staple of Peruvian cuisine. Guinea Pig is actually eaten in Ecuador and Colombia as well, so you cannot just find it here, but it is so famous that many visitors to Peru will try it at least once. One word of advise: Skip the deep-fried guinea pig and go for the roasted one instead. I shared the deep-fried one with a couple of friends in a restaurant at Lake Titicaca. It tasted like oil and salt and was very crunchy. A well-prepared guinea pig is stuffed with herbs and since it’s an expensive meat, I assume there must be more to it than an oily flavour. Locals prepare it on special days so do yourself the favour and get it in a good restaurant to get a feeling for what it’s like. This dish is for the adventurous amongst you, as it is traditionally prepared with cow lungs. Don’t let that scare you off, though. In many regions in Peru you can also find versions where the lungs have been replaced with regular pieces of meat. Just make sure to ask before you order. Chanfainita is a stew, consisting of beef (lungs or meat) and potatoes. It contains garlic, onion and aji, the pepper typical for Peruvian cuisine. Most of the time, people eat it with rice and it can warm you up on a cold day in the Andes. My favourite drink in Peru! Chicha Morada is made of purple corn. Sounds weird, I know, but it is delicious. Do not confuse it with chicha, which is corn liquor. 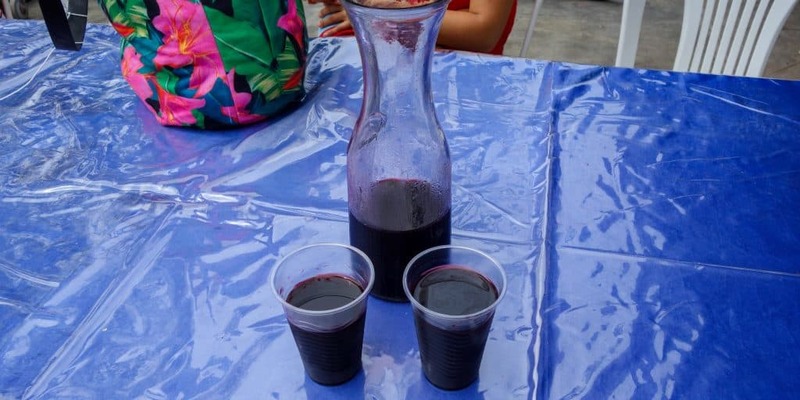 Chicha morada does not contain alcohol and resembles a lemonade, except that it looks dark purple. People prepare it by boiling corn with pineapple, sugar, cloves and cinnamon. They then let it cool down and serve it cold. Since it contains cloves and cinnamon, this drink had a taste of Christmas for me. I liked it so much that chicha morada was my favourite drink to order in restaurants. 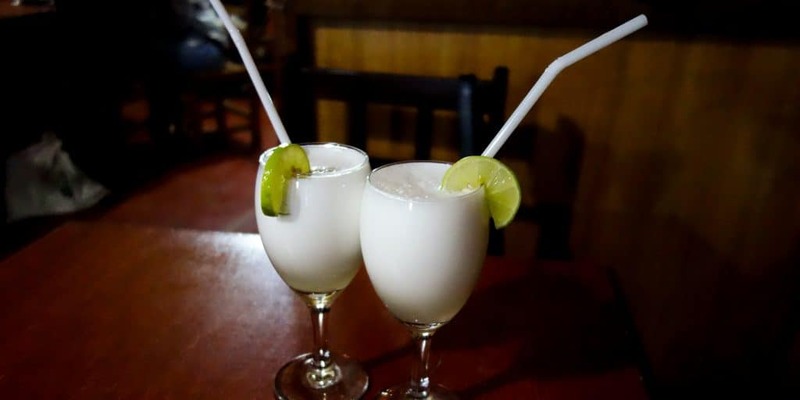 There has been an ongoing fight between Chile and Peru about who invented the pisco sour. I don’t know which country is right and the question can probably never be answered, but I do know that it’s a very famous drink in Peru that you can get all over the country. I’m not a fan of cocktails but even I had to try this one in Paracas. Pisco sour is made from pisco, a grape brandy. The sour comes from the added lime juice. It also contains ice, bitters and egg white, which give it its frothy consistency. Diana is a hot drink that I discovered in Arequipa and that kept me warm when the sun went down and the cold came creeping in. 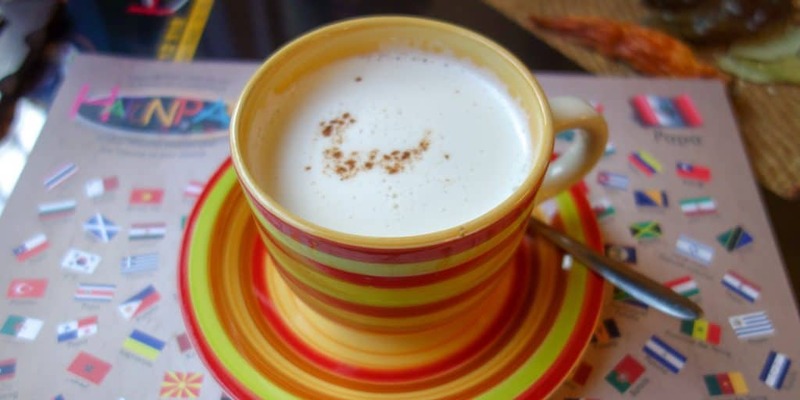 It has a creamy texture and contains almonds and lots of spices like cloves, cinnamon and coconut. Diana might not be the easiest drink to find in Peru, but if you come to Arequipa, make sure to check it out and try it at least once. There you have it, 18 dishes and drinks you should not miss when travelling to Peru. If you want to have dessert, check out my guide to Peruvian desserts. But besides these, Peru also offers a huge variety of fruits that you can try. And don’t even get me started on the desserts, that I am going to mention in a different post. Peru is a culinary hotspot. What is your favourite Peruvian dish?